They always say it’s best to write what you know about; and in Russia, Martin Sixsmith certainly knows his stuff. He writes of this particular area of one-seventh of the planet with such ease and poise, he might just as well be writing about girls or gliders, cricket or capers. 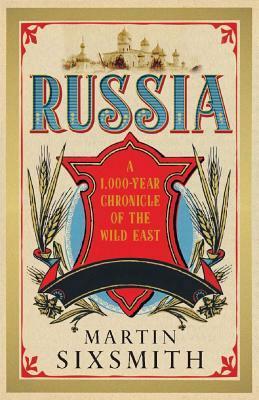 In other words, he illustrates Russia, a vast, turbulent and troubled nation and society if ever there was one, as if he were writing of a hobby, and this is what makes Russia – A 1,000-Year Chronicle of the Wild East, such an enjoyable read. Broken into five parts: ‘Kiev and Proto-democracy,’ ‘Expansion and Empire,’ ‘Rise of Revolution,’ ‘ Dictatorship (of the People? )’ and ‘Democrats with Cold Feet.’ these 575 pages (not including Index and Picture Credits) hurtle along as if on a historical rollercoaster of nigh magnetic, mystical mayhem. The above passage already bequeaths the impression that some of the political temerity the author is about to unravel, will be both complex albeit very colourful. And in the hands of a lesser writer, such a quest would probably fall down after the first or the second chapter, but this absolutely isn’t the case here. As the author makes clear, he was there. Sixsmith lived alongside Russia’s most acute clash of ideologies during the early nineties; which, as he goes on to reveal in chapter thirty-eight, remained just as riddled with inadvertent reluctance and uncertainty as was (historically) expected: ‘’Having lived through the Gorbachev years in Russia, it seems to me that Gorbachev was obliged to embark on a policy of change because of he Soviet Union’s parlous economy, but that he intended this to be only ‘within system’ change, revitalising the one-party state by unleashing a measure initiative, energy and enterprise. In a political culture that refused to acknowledge its shortcomings, he was unwilling even to use the word ‘reform,’ referring instead to uskorenie (acceleration) or perestroika (restructuring). Russia – A 1,000-Year Chronicle of the Wild East is a very substantial reminder of how much the country, along with all former Warsaw Pact countries, has changed – especially since the end of the Second World War. For this reason alone, I’d strongly recommend it to anyone with an interest in Russia’s troubled past and history, politics and religiosity, folklore and social policy. If nothing else, the book most certainly weaves an interesting course throughout all of these topics, without ever getting too entangled in any particular area. This entry was posted in Current Affairs, History, Miscellaneous, Politics and tagged Martin Sixsmith, Perestroika, Russian Folklore, Soviet Union, USSR. Bookmark the permalink.